Now that I’ve given my talk at the iridescence conference, I feel like I can relax and reflect on the last few days. The biggest success of this trip so far was undoubtedly making it across the border. When I arrived at the airport, I was informed by a rather sour US customs lady that because I didn’t already have a return ticket, she didn’t have to let me into the country. This was news to me, but in retrospect my story that I was a grad student attending a conference and then traveling indefinitely in California probably wasn’t the best choice. Customs lady expressed her disbelief, handed my passport back to me in a bright yellow folder and directed me to take my warning-beacon folder into a special room for suspicious types. I was terrified that she would would somehow find and confiscate the stuffed peahen or any of the other bizarre (but critical) items in my suitcase full of field equipment. Somehow, however, I was able to get by without having to provide any more details about my plans. As for the peahen, I waited until I was settled into my Arizona hotel room before anxiously opening the suitcase to survey the damage. I’m relieved to report that she survived the trip without confiscation or serious injury. Although she does look a little worse for wear I’m confident that the males will still find her an acceptable target. The conference has been amazing – I’ve heard talks from the world’s experts on the physics, development, evolution, and behavioural display of nanostructural colours in animals. The very first talk was on ways to manufacture macro-scale versions of the colour-producing nanostructues found in butterflies, and then use microwaves to measure optical properties of these models in a scaled-up way. The advantage of this technique is that it lets you get around the problems of performing accurate optical experiments with very small things (such as single butterfly scales). I’ve also heard about how to model the optical properties of animal nanostructures, how to improve my goniometer for feather colour measurements, how insects build crystal-like cuticular nanostructures with exquisite control at the cellular level, and how some butterflies are similar to peacocks in terms of orienting themselves for optimal reflectance of their iridescent wing colours during display flights. We’ve had serious discussions about the developmental differences between “squishies” (vertebrates) and “crunchies” (arthropods), the meaning of the word “crystal”, and the use of dark framing around bright colours in both art and animals. By far the most interesting talks, however, were about work from the Hanlon lab on the cuttlefish colours. Cephalopods have evolved an incredible ability to control the hue, patterning and texture of their skin – including what one speaker referred to as “changeable iridescence” – for use in predation and camouflage as well as in conspicuous signaling. Cuttlefish skin contains a base layer of bright blue-green iridophores covered by a layer of pigment sacs called chromatophores. All of these structures are laced together in a network of muscle cells allowing the cephalopods to actively control their appearance by essentially expanding or contracting the sacs of colour. 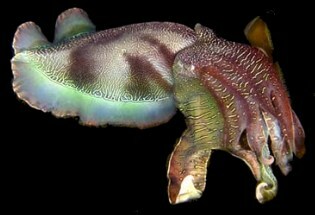 Amazingly, the iridophores can reflect polarized signals that cuttlefish can perceive but that predators cannot. By producing this polarized iridescence from beneath the layer of pigmented chromatophores these animals can accomplish camouflage and signalling simultaneously. For those interested in camouflage, I’ve also learned that a number of sea creatures produce a countershading effect by producing iridescence or even bioluminescence on the undersides of their bodies. Apart from the mystery font-size changes and video problems on the conference laptop, my talk went tremendously well. I managed to draw a crowd of questioners afterwards and received a great deal of feedback (and encouragement) – sweet. Time to start worrying about how to draw a crowd of peacocks instead.